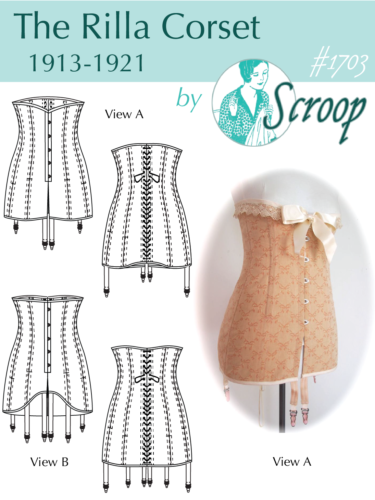 As a celebration (slightly belatedly) of the release of the Scroop Rilla Corset, over the next few weeks I’ll be doing a series post about the ‘ideal’ figure from 1913 to 1921 – the period covered by the Rilla corset. 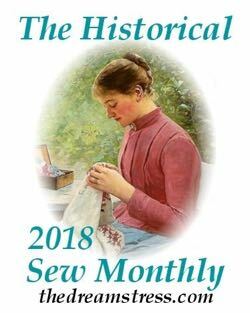 I’ll be covering how the figure ideal changed from 1914 to 1921, how corsets and other undergarments were used to achieve the ideal figure and ‘correct’ the less than ideal figure, and how to wear a 1910s corset if you are ‘large above the waist’, and how to fit the Rilla to your figure. Of course, in any era, beauty is in the eye of the beholder: what the ideal figure is depends on who is describing it, so there are lots of variations. 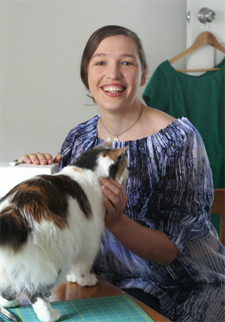 Part of the reason I really love the 1914-1921 period is that it covers a vast range of fashionable silhouettes within that 7 year range, even within a single year, and with so many different waistlines, necklines, skirt silhouettes and overall ‘looks’, there is a mid-teens style for every body. 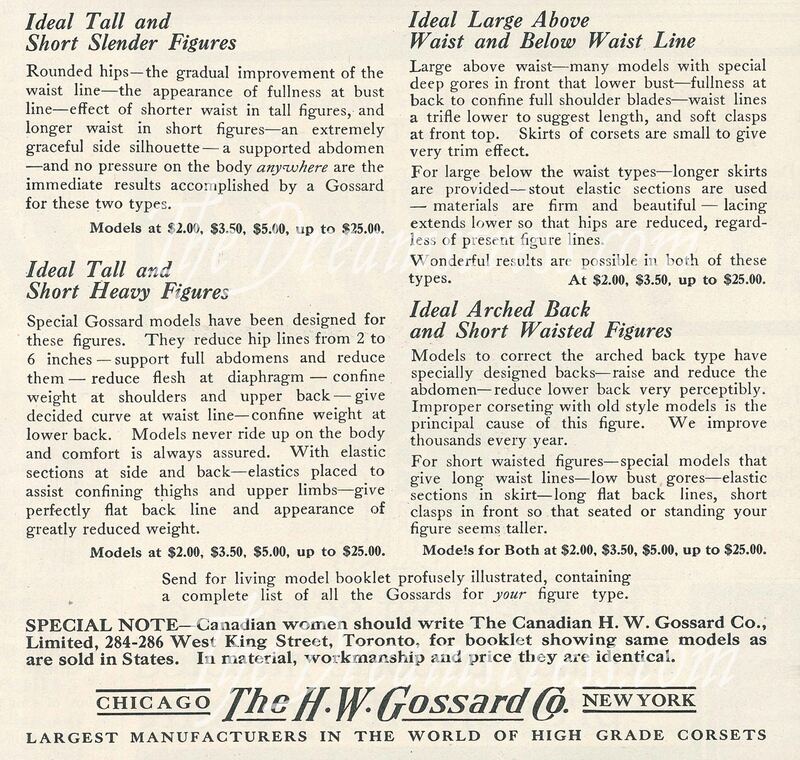 To start off with, a look at the range of ideal bodies from a Gossards Corset advertisement from The Designer magazine, October 1916. Gossard’s was an American corset manufacturer that heavily marketed their range of corsets for specific individual figures, with each different style of corset being designed to mould your particular type of figure into the fashionable ideal. 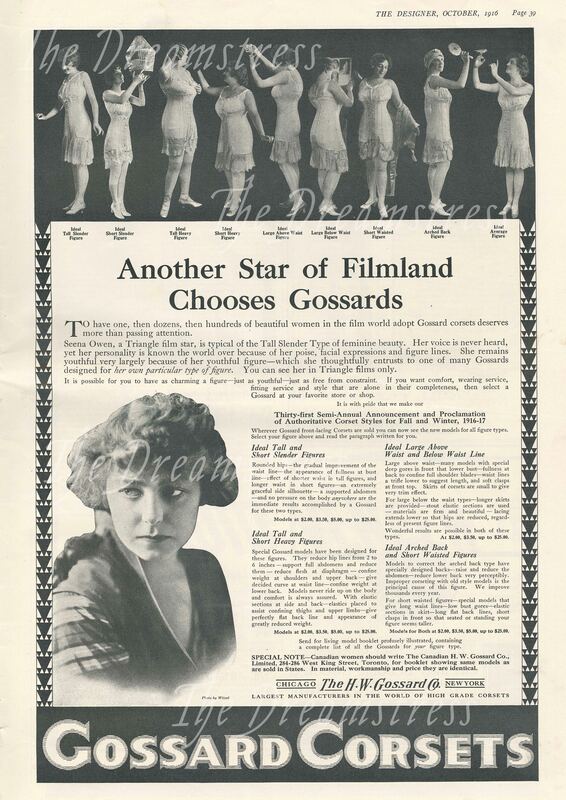 I’ve got quite a few Gossard’s advertisements in my magazine collection, but this one is particularly interesting as being an early example of the use of Hollywood stars to market fashion and beauty. Of course, the problem with these is figuring out where your figure would sit. I could plausibly see myself falling into the Average Figure, Arched Back Figure, Large Below Waist, or possibly even the Tall Slender Figure category! I rather like all these ‘ideal’ body shapes & corsets to fit! 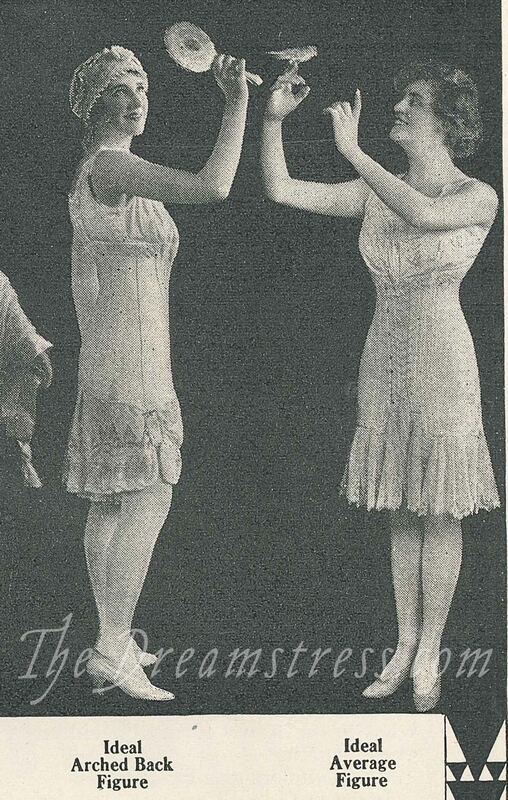 Wish we had clothing like this to accommodate different body types today. I’m tall, heavy, & short waisted so not sure where I’d fit in though. Fascinating. It’s a shame they didn’t do a before and after comparison of their models, so we could see more clearly the “improvements” made by the corsets. 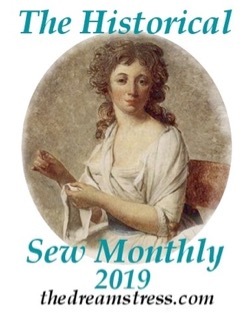 How did women sit in those corsets? Maybe they were so busy working on housework that they didn’t? These are exactly the same type of corsets I wore for my Fortnight in 1916, and they are very comfortable to wear all day, and to sit in :-). Modern furniture isn’t so good for them, because our couches are made for slouching and lounging back in to, but anything period, with a straighter back, is perfectly comfortable. 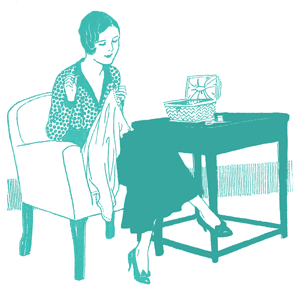 Part of the trick is that all of the bones end before your body curves for sitting. That poor Ideal Short Heavy Figure appears to have mislaid her hand somewhere! Hey, I’m an ideal tall, heavy! This is interesting. I did not know back then manufacturers would make so many different sizes and shapes to accommodate woman’s bodies. I don’t know if we have so much in ready to wear in current times.